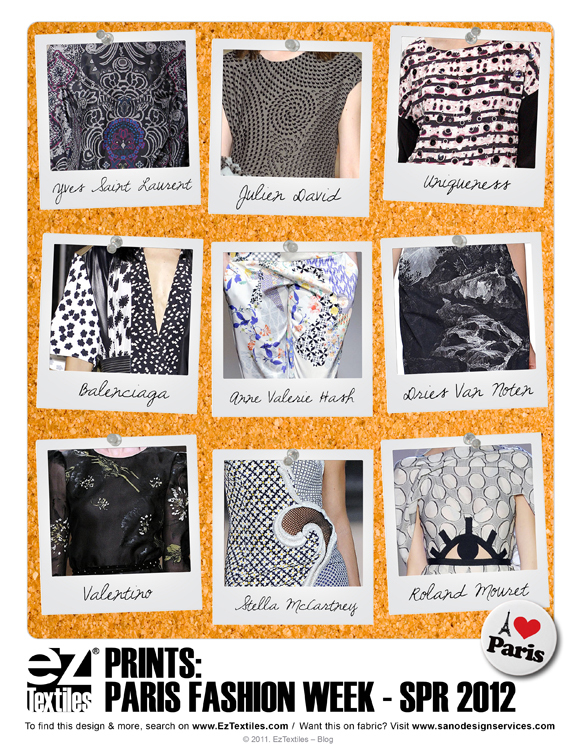 Paisley is a big trend this spring as we noticed them popping up in a lot of S/S12 shows like Stella McCartney, Jil Sander, and AW Anderson. 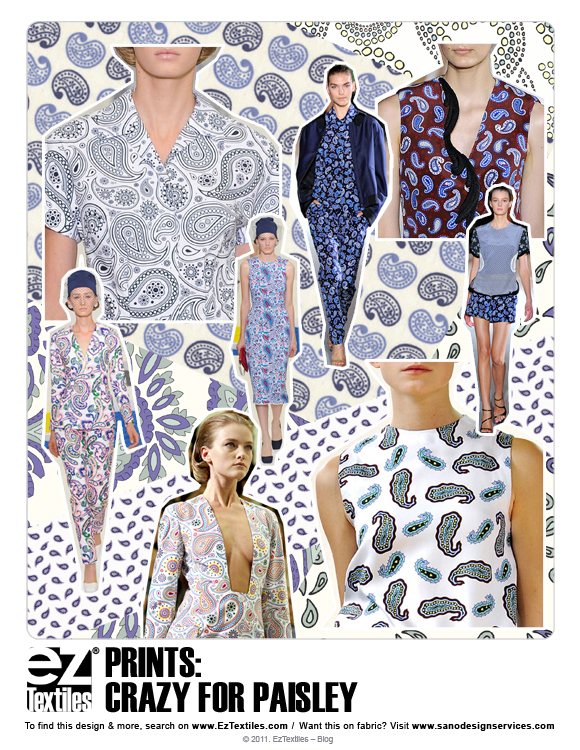 Big or small scale, this print is showcased in a number of silhouettes from dresses to blazers to shorts. Did you know when you download a print from EzTextiles you can fill it into your own sketch? Start with some ideas from our Crazy For Paisley Board so you can download and play! Strolling the streets of Tribeca, we spotted this lovely lady wearing such an outstanding coat! Check out her over-sized houndstooth print! Right on trend, we love the use of red instead of the everyday black and white and of course we had to head to our library to see what we could come up with! Getting huge print proportions is a snap on Eztextiles, because you can quickly zoom a print repeat in and out to make it just the right size! Visualizing just got a whole lot easier! Click the image below to check out our collection based off her delightful outerwear. 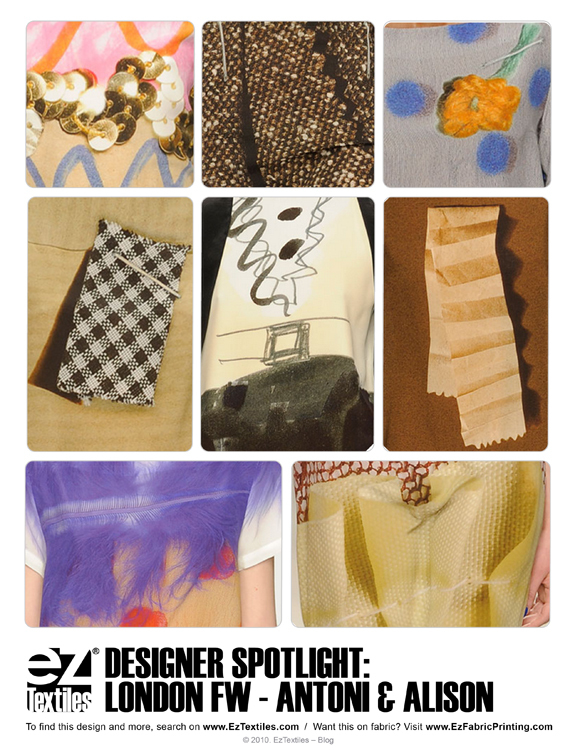 Fashion Week has begun and we’re pumped to see all the color on the runway! 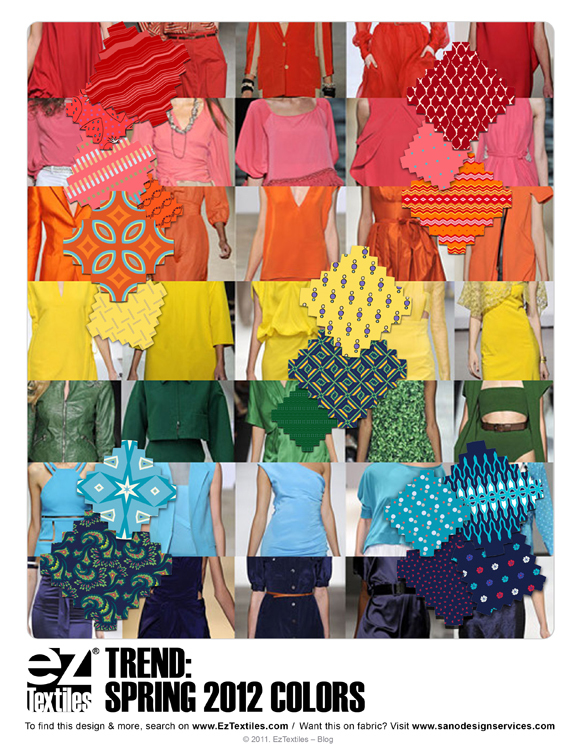 Check out the color trends we’re seeing for Spring. We took this palette over to our library and started searching for prints that we can use for Spring! Did you know that once you find a color you like, you can lock that color and do a search to find other prints that have that same color? It’s a useful tip if you’ve got a certain palette in mind, and need to see complimentary prints! 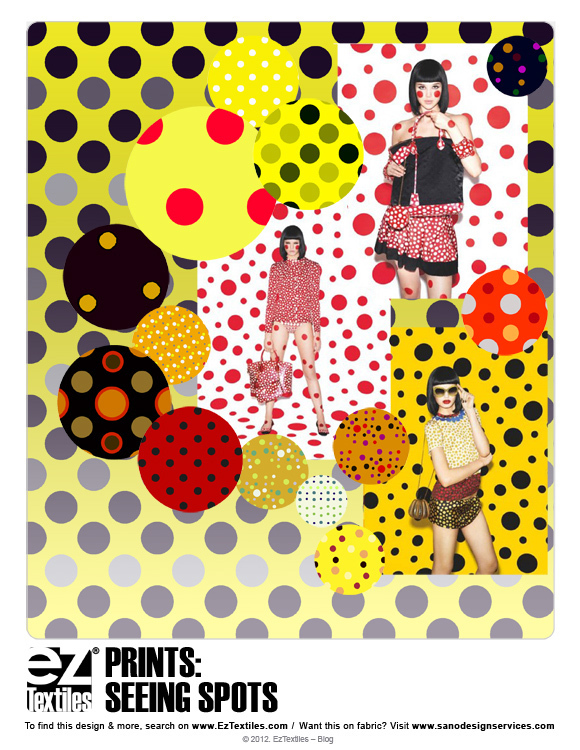 Once you’ve decided on your colors for Spring, why not head over to our print library and start your own collection? Don’t forget to share on Facebook and Twitter! It may be Summer break for some, but the rest of us still want to look snazzy in the office! We’re loving the looks below; pairing these fun prints with neutral solids helps to keep a nice balance. Be sure your fall line-up is sprinkled with prints that show your design aesthetic so that your consumers can recognize your brand by a quick glance! Have you started your collection yet? Click our trend board below to go straight to our collection. We are loving the trend of mixing unexpected prints. If you are designing a collection and have your color palette set… then mix up the patterns; pair oversize florals with bright gingham checks or bold graphic geometrics! 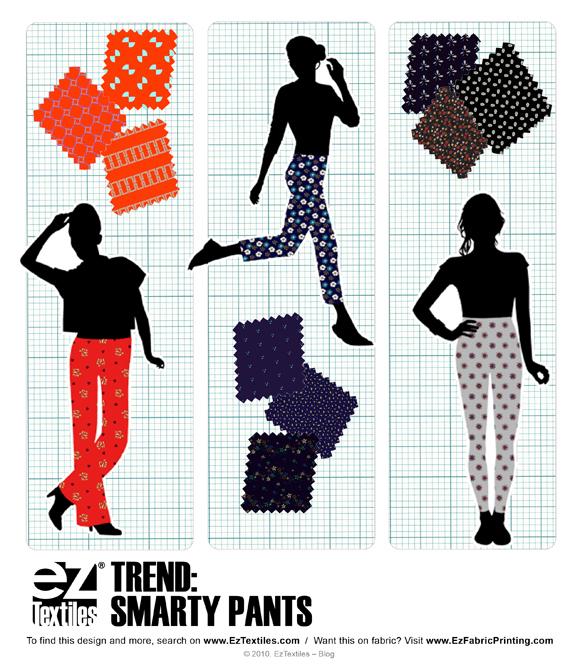 Check out our mixed collection with patterns from EzTextiles.com then start building one yourself! 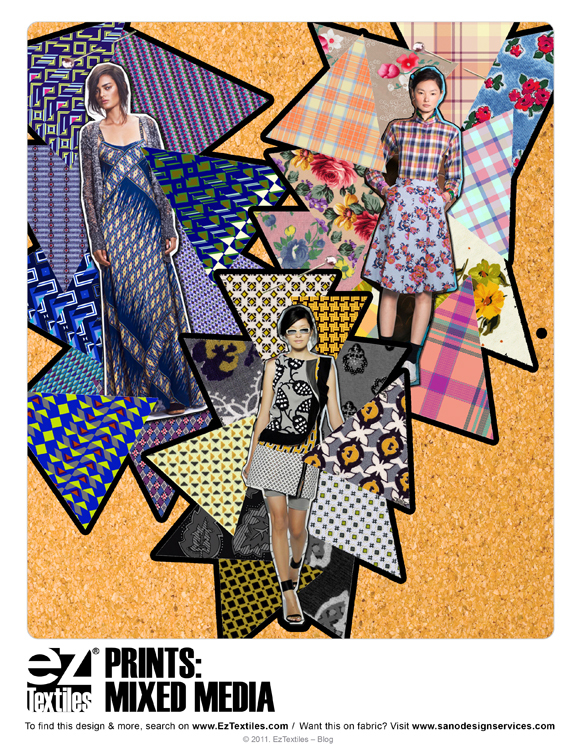 Check out some great mixed prints from our board!